Sold in November 2010 as Erica XI, this 31.7m sailing yacht is back on the market renamed Cara Maria and listed for sale by Bill Titus at Northrop & Johnson. Cara Maria was built by Jongert in 1997, and is the eleventh boat to be built by her original owner and so is exceptionally well thought out. Built to Lloyds 100 A1 classification, she is in excellent condition and offers several features over and above the usual well-built Jongert. These include a lower coach roof for sleeker lines and more fuel tankage for a 2,500 nautical mile range under power. She also has captive winches for short-handed sailing and a fourth stateroom plus extra head so that she can sleep 10 guests in a master and three twins plus two Pullman berths, all with en suite bathroom facilities. She features a John Munford interior in American cherry wood and the pilothouse/deck saloon can be open or closed to the weather. 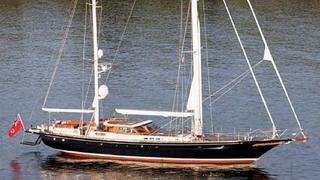 Lying in Newport, Rhode Island, Cara Maria is asking $3,950,000.